Looking for something festive, holiday-like and chaotic for the blog, I came across color-changing cats. 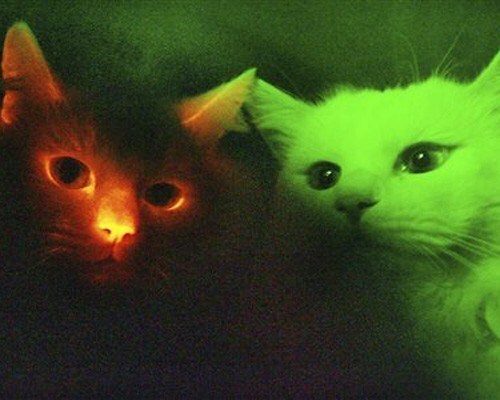 The history of color-changing cats is a fascinating one, involving Carl Sagan and accurate predictions of unfathomable chaos over the next ten thousand years. Because while we don’t know what life will be like that far in the future, consider how much the world has changed in the last hundred, and square that. Of course, 10,000 years matters because it’s both substantially longer than meaningfully recorded history (or even a meaning for meaningful recording of history), and because it’s a good approximation for how long certain radioactive isotopes will remain dangerous. So the US government, producer of said isotopes in its nuclear weapons programs, has convened panels of the great and clever to consider how to ensure that those isotopes are protected. Solutions were proposed including a skull and crossbones and giant spikes surrounding the site. One of the few things that’s for certain, over the next ten thousand years, assuming people are around, some will continue to ache for control they cannot achieve, and produce crap like a DRM-enabled litter box.